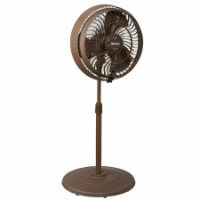 Outdoor misting fans are perfect for cooling off your backyard, patio or deck areas. They provide simple, drip free and effective cooling relief for any backyard function, party or bbq. 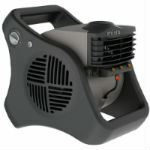 Holmes and Lasko are the leading manfacturers of outdoor misting fans and water misting systems. Our outdoor misting fans offer a much more flexible cooling solution than other fixed overhead outdoor misting solutions. 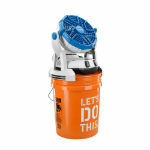 With portable backyard misting fans you can move the cool water mist where you want it and where you need it. You also control the amount of cooling mist that you want. With fixed misting solutions, you cannot move the mist or control the flow of the mist, making them difficult to install and use. Also, unlike other misting fans, our portable misting fans connect directly to your outdoor garden hose offering quick and continuous cool water mist. You won't ever have to worry about stale, old or stinky water as our backyard misting fans circulate only new fresh water. The fans are easy to store as there are no tanks to drain and let dry before you store them. With continuous misting, our backyard patio misting fans ensure that you are cool, comfortable and refreshed. With the Holmes 16" Outdoor Misting Fan or the Lasko 7050 Misto Outdoor Misting Fan, you will be able to expand your living spaces comfortably outdoors, effectively increasing the size of your entertaining space. The included 3-prong GFCI plug allows for safe use and storage outdoors. 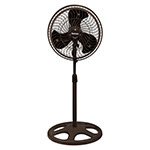 These misting fans can cool the surrounding air by as much as 25 degrees keeping you cool, comfortable and relaxed! Your family will be happy and cool and you’ll have the “coolest” backyard in the neighborhood!